6 | TH E M R EP O RT TAKE 5 Strength Going Forward Tom Wind is President of U.S. Bank Home Mortgage, one of the largest originators and servicers of home loans in the United States. The company funded in excess of $53 billion in home mortgages during 2016 and provides loan servicing for approximately 1.9 million customers. U.S. Bank Home Mortgage is a nationwide provider of mortgage lending products through its retail, correspondent, wholesale, and warehouse finance divisions and has employees in 26 states. Wind is a mortgage industry veteran with more than 25 years' experience in finance, capital markets, and executive leadership roles. He was most recently EVP of residential and consumer lending, at EverBank Financial Corporation in Jacksonville, Florida. During his career, he has held executive positions with some of the nation's largest lenders including Lehman Brothers, JPMorgan Chase, and CitiMortgage. 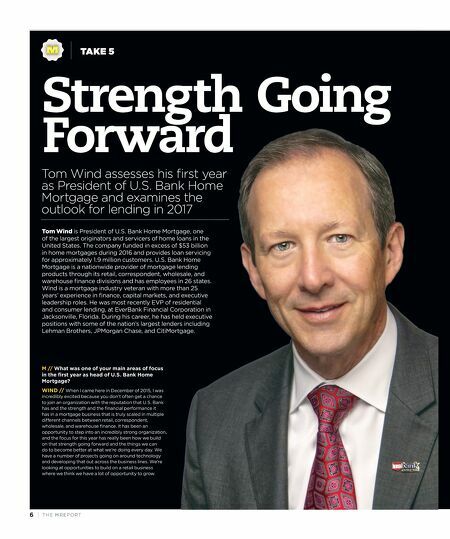 Tom Wind assesses his first year as President of U.S. Bank Home Mortgage and examines the outlook for lending in 2017 M // What was one of your main areas of focus in the first year as head of U.S. Bank Home Mortgage? WIND // When I came here in December of 2015, I was incredibly excited because you don't often get a chance to join an organization with the reputation that U.S. Bank has and the strength and the financial performance it has in a mortgage business that is truly scaled in multiple different channels between retail, correspondent, wholesale, and warehouse finance. It has been an opportunity to step into an incredibly strong organization, and the focus for this year has really been how we build on that strength going forward and the things we can do to become better at what we're doing every day. We have a number of projects going on around technology and developing that out across the business lines. We're looking at opportunities to build on a retail business where we think we have a lot of opportunity to grow.